The club was established in May 2001 and registered as a Charity in December 2001, it embodies the villages of Crawley Down, Turners Hill and Copthorne. 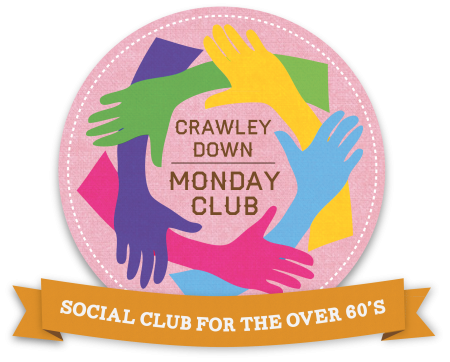 We meet each Monday from 10.30 – 2.30p.m at the Haven Centre, Crawley Down and offer a cup of tea or coffee on arrival, a 2 course lunch at noon, followed by a raffle and entertainment. It is a warm and friendly environment and is a great way to enjoy the company of other members, numbering around 50, who thoroughly enjoy the few hours spent with friends.Why not start the week off with a good old chat and some humour? A great team of volunteers ensure that all are made welcome and looked after; you don’t even have to wash up after lunch! There is a small charge of £5.00 per week, which includes membership, and some transport may be available from Copthorne, Crawley Down and Turners Hill. You can call Marion on 01342 458559 or Molly on 01342 712022 to arrange a FREE VISIT and further details or use the contact page on this website. The membership is for the over 60’s, there is no age restriction for volunteers and we welcome anyone who may like to come along and support the club in any way they can. We moved on the 5th February 2018 to The Haven Centre, Crawley Down.